(L – R) Former Los Angeles Mayor and State Assembly Speaker Antonio Villaraigosa and George L. Pla, President & CEO of Cordoba Corporation. 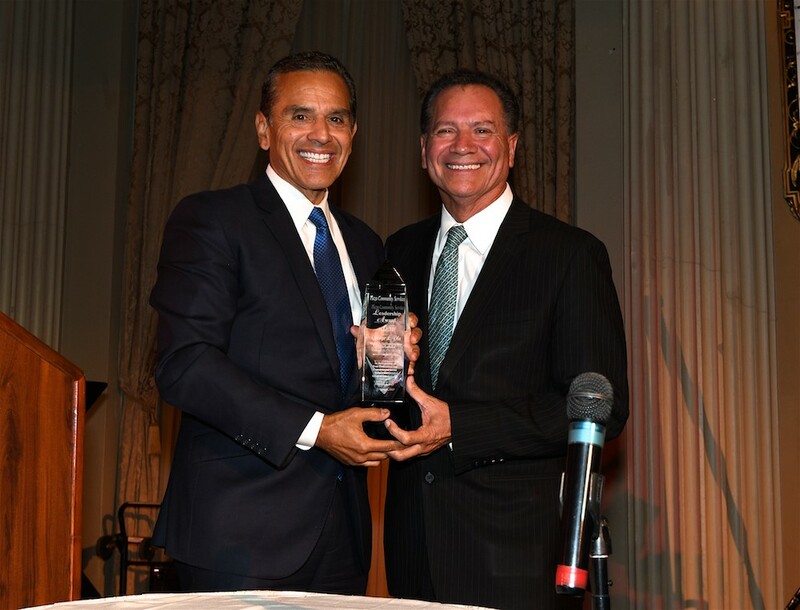 George L. Pla, President & CEO of Cordoba Corporation was one of four civic and community leaders honored by Plaza Community Services at its “Bridges of Opportunity” Dinner on Friday, October 6, 2017, at the Millennium Biltmore Hotel in Downtown Los Angeles. Mr. Pla, who was introduced by former Los Angeles Mayor and State Assembly Speaker Antonio Villaraigosa, received the “Community Development Award” in honor of his enduring work to give back to the community and to inspire future leaders. In his introduction, Mayor Villaraigosa shared about George Pla’s roots as an activist fighting for empowerment and inspired by the hope and optimism of the 1960s. Mayor Villaraigosa explained how George later went on build a thriving business, Cordoba Corporation, which is now an ENR Top 50 Program Management Firm and Top 100 Construction Management-for-Fee Firm specializing in the delivery of infrastructure projects in the transportation, education, water and energy sectors. In receiving the award, Mr. Pla thanked Plaza Community Services’ staff and board members, and acknowledged the evening’s other honorees, characterizing them all as “warriors.” He focused his acceptance speech on highlighting the mission of Plaza and how it is still relevant now more than ever — more than 100 years after it was founded. He saluted event sponsors, reiterated that the new model for non-profits is a combination of both government funding and private sector money, and emphasized that it is vital for the private sector join him in supporting Plaza. The evening’s other honorees included: Castulo de la Rocha, Founder & CEO of AltaMed Health Services (Health Services Award); Domenika Lynch, President & CEO of the Congressional Hispanic Caucus Institute (Education & Empowerment Award); and Luis A. Carrillo – Carrillo Law Firm LLP (Victims’ Rights Award).